I’ve been playing with this pattern for a while now, as in, for about a year and a half or so! 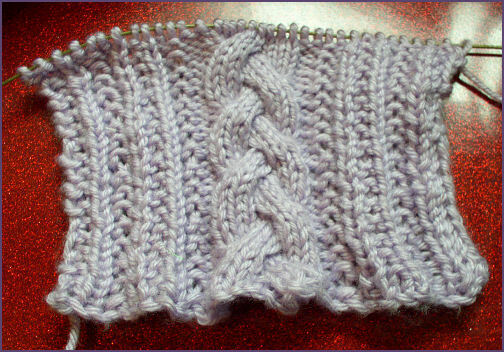 I started it when I was a beginning knitter, but it is only now that I was able to figure this out so that the two sides on either side of the cable mirrored each other. And by jove, I think I’ve finally got it! I’m so excited that I thought I would share it now, even though my scarf, as you can see, isn’t even done yet!! Repeat rows 1-8 for pattern. If you prefer, (which I usually do), you can slip the first stitch of every row after row 1. I find this helpful for getting a nice smooth edge. Gauge isn’t really that important for this pattern. 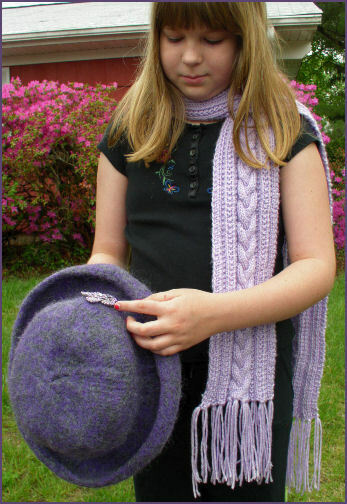 The bigger your yarn, and the larger your needles, of course, the wider your scarf will be. I hope you enjoy this pattern. Please feel free to let me know!